This blog is not meant to be a platform for controversy, but here I go: I couldn't care less about the NFL. Okay, okay. Hush your shocked gasps and anguished sobs. Game-day culture, on the other hand, thrills me to no end. I love that people – of all ages, backgrounds and beliefs – come together to support a shared love (or shared distaste) for a team. Friends and family dress up in their swag just to hang out and cheer next to a TV. We play games before and during the broadcast football game. And the game day drinks and snacks often get as much hype as the game itself. 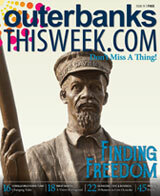 This culture is no stranger to the Outer Banks. In fact, it’s welcomed – even cultivated – at Outer Banks restaurants. Beyond displaying a game or two on a TV above the bar, many restaurants celebrate football season with special menus and happenings that really transform watching the games into an event. Depending on what type of football viewing experience you’re looking for, there’s always at least one Outer Banks restaurant that provides it. Here are a few popular places for watching Sunday football and what you can expect to find at them. When you think of restaurants that cater to football viewers, the go-to image that likely comes to mind is gathering with your buds – and perhaps making new ones – at a sports bar. For a classic feel of cozying around the bar, Red Drum Taphouse in Nags Head offers a generous, yet intimate, space where folks can focus on the games while sampling the many different brews on tap in addition to fresh and creative seafood dishes. For an extra taste of autumn, Sundays are also Turkey Dinner night at Red Drum. On the northern beaches, the sports bar at Uncle Ike’s Sandbar & Grill has served as a Corolla watering hole for years, especially for late-night entertainment. Whatever the season, their 10 72-inch TVs showcase all the appropriate sports networks and games. And in the fall, all the focus is on football. If you’re looking for a sports-oriented bar where you can get the most football bang for your buck, so to speak, you’re going to need an abundance of TVs so that you can track every minute of action as every game unfolds. Seriously, you’re gonna forget to blink! 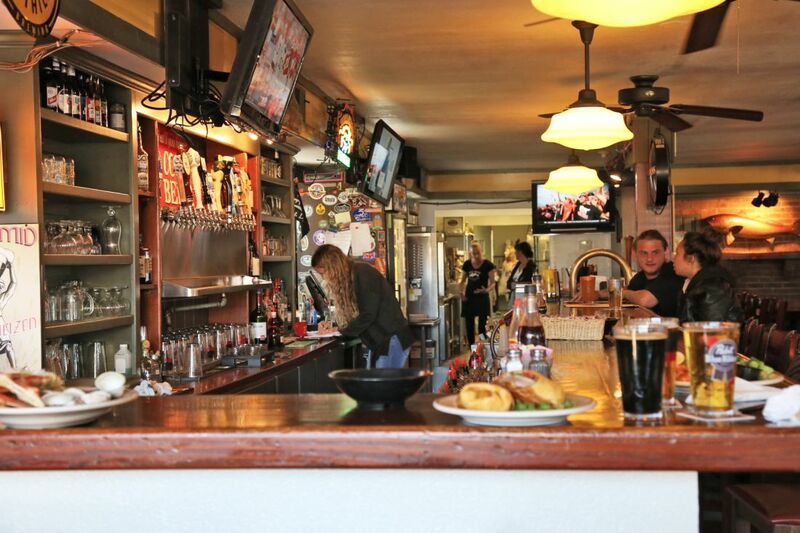 Game-day vibes pervade through Lucky 12 Tavern in Nags Head with fans rolling in for classic football snacks, like nachos, wings and mozzarella sticks, in addition to a generous bar featuring more than 100 kinds of beer. If you want to change up the standard football snacks but don’t want to lose them completely, try Barefoot Bernie’s in Kitty Hawk. They pair island-inspired tapas, like Baja chicken eggrolls or the Ahi tuna bowl and drink specials with 20 TVs. Eight of them even wrap in a semi-circle around the bar. With tackles, flags and touchdowns happening everywhere you turn, you’ll feel like you’re on the field with the players. Match America’s pastime with home-style Italian fare at the New York Pizza Pub. 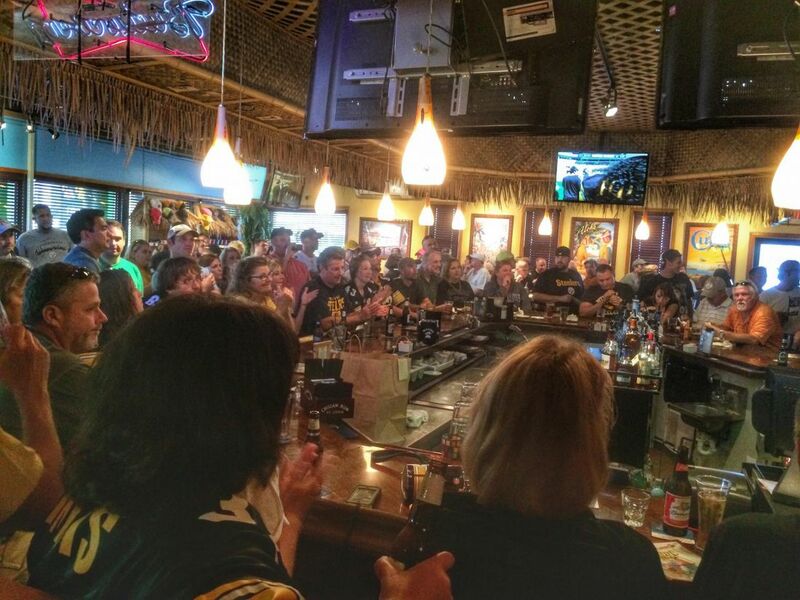 The Pizza Pub is one of the leaders in evening entertainment on the Outer Banks, but football is the name of their game on Sundays. Watch every team, sports analysis and game-day commercial on any of their 28 TVs, and keep tummy rumbles quelled with slices of pizza and parmigiana. 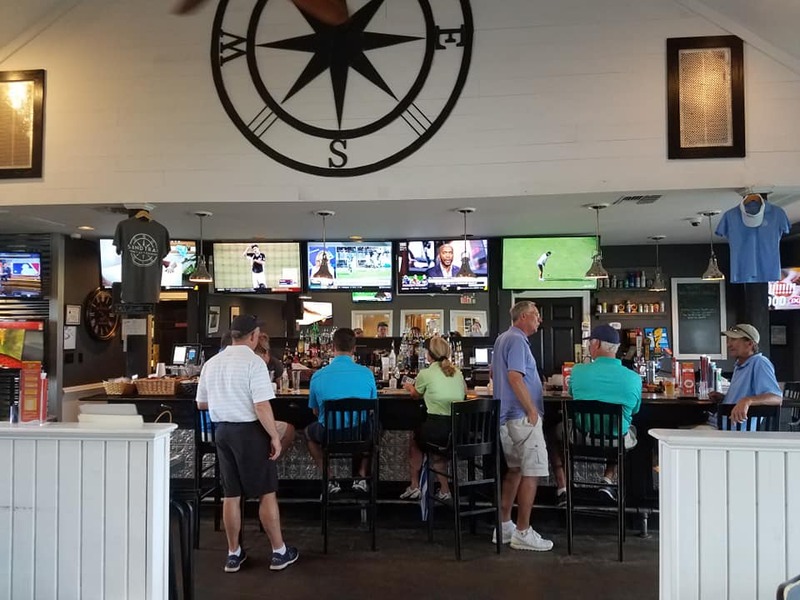 For a little bit of a different Sunday scene from the casual – though frequently impassioned – sports bar, check out Sea Scape Golf Course’s adjacent Sandtrap Tavern, which is quickly building a reputation as one of Kitty Hawk’s newest hangouts. Run by the folks from Sooey’s, this tavern-style restaurant serves pub favorites with a Southern twist. Come for their NFL Sunday Ticket, with includes a Big Ten package on their 17 65-inch TVs and food and drink specials, including a Bloody Mary bar. There are many more places to check out, too, when you want a good crowd, delicious food and drink specials to complement your Sunday NFL viewing. 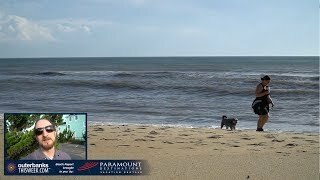 However, if you’re like me and can only endure so much of watching people concuss each other for the sake of a tiny ball, there’s no shortage of other Outer Banks events to fill your weekend. For instance, Duck Jazz Festival returns this Saturday and Sunday and will fill the town with its smooth and groovy tunes. Don’t forget to mark your calendar for the Mustang Rock and Roast next Saturday and Sunday, October 13 and 14, at Mike Dianna’s Grill Room. Enjoy oysters, barbecue and more than 12 different musical acts, including student bands from the Mustang Outreach Program. Get your tickets here!